Guantanamo. Manzanar. Tule Lake. In times of war, America does not have a spotless record when it comes to dealing with its citizenry. In fact, fear can and has driven the country to do some very unconscionable things. Konrad Aderer’s new documentary “Resistance at Tule Lake” (2017) is another bittersweet addition to the recent canon of films charting the gross injustices of the American system. This time Aderer is shedding some light on a somewhat unknown chapter in American history: its treatment of the Japanese population stateside during World War II. America’s response to Japan’s attack on Pearl Harbor in December of 1941 was to detain all the Japanese living in the United States and house them in government-built concentration camps. Yet, what the history books get wrong is that the Japanese did not just peacefully give up their rights and allow the white Anglo-American population to shuffle them away in some isolated facility like lepers at a leper colony. 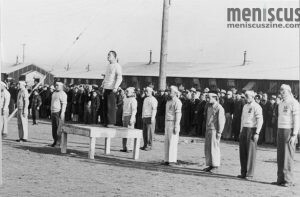 The Japanese, be they first-generation immigrant Issei or American born-and-raised Nisei, protested their treatment and rebelled against their American overseers at the various camps that housed them. Aderer’s documentary charts from the moment President Franklin Delano Roosevelt signed the order giving the American military carte blanche to detain any persons that they considered to be “enemy aliens” to the government’s acknowledgement and apology much later of their unfounded, unconstitutional, and racist actions against the Japanese. For many viewers, “Resistance at Tule Lake” will not be an easy watch. Assisted by newsreel films from that era and interviews from surviving Japanese internees, these source materials are a searing indictment of the American government in that era. The newsreels showcase the complete obliviousness of the American public’s perspective on Japanese internment. The interviews from surviving Japanese internees are maddeningly depressing as they nonchalantly tell of their experiences in the camps. They fight back tears as they tell their story, yet they end each harrowing tale of deprivation and humiliation with the same sentiment: that they still love this country and are proud to be Americans. What elevates Aderer’s documentary as something more than just propaganda is the lack of narrative agenda. Though the film chronicles the detainees and is told through their eyes, it makes no attempt at trying to give voice to the guards or American military personnel working at Tule Lake or any of the other internment camps, nor does it go about demonizing those tasked as overseers. They are treated as a metaphor, the physical embodiment of American fears and hatred but without any of the inherent maliciousness that might be part of the narrative in a Nazi concentration camp. Even when Aderer mentions specific names of guards or officials, he does so without any dramatic flourish; they are just men with flaws like the rest of us. Though the film’s focus is on a single camp, Tule Lake, the tales told by the survivors could have come from any of the internment camps that dotted the American landscape. “Resistance at Tule Lake”’s mature presentation doesn’t offer any new answers to the conflict of “white vs. yellow” during World War II, but it does make a good case for why the story must be told. “Resistance at Tule Lake” was a selection in the 2017 San Diego Asian Film Festival Spring Showcase. It will screen at Japan Cuts 2017 in New York at the Japan Society on Wed., July 19, at 6:30 p.m. For tickets, go to japansociety.org.